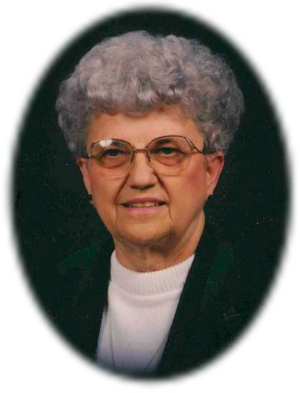 Obituary – Vculek, Winifred Lee (Lovekamp) « Perry High School Alumni Association, Inc.
– daughter of Mr. and Mrs. F. C. Lovekamp, Perry, route 3, was born on a farm southeast of Perry 17 years ago. She attended grade school at Pioneer school district 40, for eight years before entering high school at Perry. Miss Lovekamp plans to enroll at A. and M. college at Stillwater this fall. Winifred Lee Vculek, 82, of Perry, Oklahoma, was the daughter of Fred C. and Catherine Bamberger Lovekamp. She was born on October 25, 1926 in Perry, Oklahoma and died Sunday, November 9, 2008 at the Westhaven Nursing Home in Stillwater, Oklahoma. Winifred was a 1944 graduate of Perry High School. She attended Oklahoma A. and M. College. On July 5, 1956, Winifred married Anton Joseph Tony Vculek in Guthrie, Oklahoma. He preceded her in death on December 22, 1979. Winifred worked at the County Extension Service for 13 years and Citizen State Bank in Morrison for 35 years. She was a member and treasurer of the Stillwater Travel Club and a member of Zion Lutheran Church in Perry. Winifred enjoyed going to work each day and being around the people of the Citizens State Bank and traveling with the Stillwater Travel Club. She enjoyed spending time with her family especially during the holiday season as she prepared a wonderful meal for all to enjoy. Funeral services will be 2:00 p.m. Friday, November 14, 2008 at the Zion Lutheran Church in Perry. Interment will be in Grace Hill Cemetery. Services are under the direction of Brown-Dugger Funeral Home in Perry. Memorials may be made to the American Cancer Society in care of Brown-Dugger Funeral Home, 1010 N. 7th Street, Perry, Oklahoma 73077. Winifred is survived by one sister, Eleanor Sherwood of Stillwater, Oklahoma; four nieces, Anne Gattis and her husband, Bill, of Grand Prairie, Texas, Carol Sherwood of Oklahoma City, Oklahoma, Joan Sherwood and her husband, Jay Casey of Stillwater, Oklahoma and Kathy Gray and her husband, Donnie, of Vinita, Oklahoma; two nephews, Alan Harrah and his wife, Cheryl, of Vinita, Oklahoma, Art Feemster of Arkansas City, Kansas; nine great nieces and nephews and five great-great nieces and nephews. She was preceded in death by her husband Tony Vculek, one sister, Helene Harrah, one nephew, Theodore Harrah, Jr. and one niece, Bonnie Feemster.